Increasingly dedicated and appealing products, increasingly diversified services. The Lameplast Group is the corporate embodiment of the single dose units. Not only can the Lameplast Group boast an original pack, then, but also innovative filling, now specifically conceived for sterile filling. Top of the range is the brand-new model Pentafill A25 (picture 1), that will be presented in November 2017 during Andina Pack, Colombia and PMEC India exhibitions. 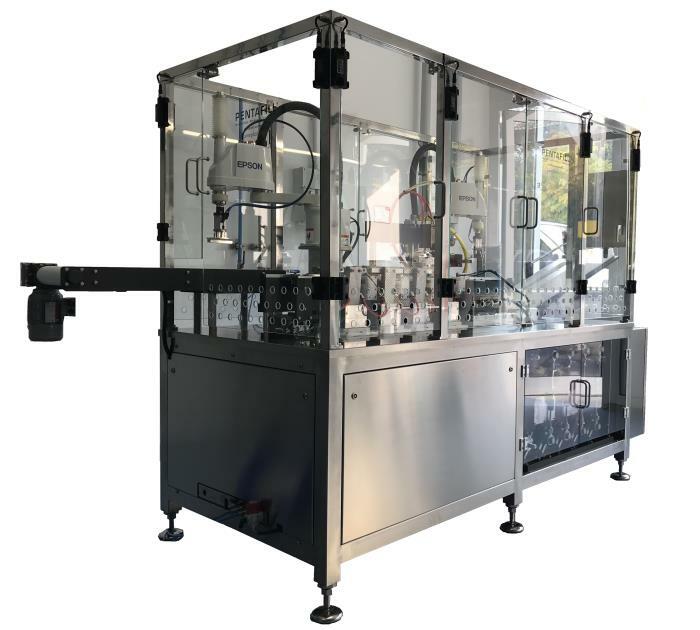 Pentafill A25 is an automatic filling and sealing machine specifically designed to work in a sterile environment, capable of processing single-dose capacities from 0.3 ml to 10 ml for medium production runs. Versatility is a key feature of this machine, as matter of fact it can be easily connected to any existing packaging line. Moreover it is suitable for small rooms and very easy to maintain. It could incorporate a laminar flow system to ensure sterile filling during operation, as in the new Pentafill A15L, launched in October 2017 (picture 2). 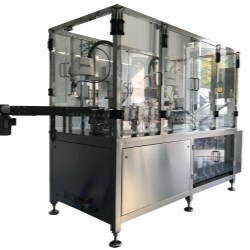 The Group can today offer its customers seven types of semi-automatic or automatic single-dose units filling and sealing machines, ideal for small and medium productions. All seven models are available in a standard version but may also be adapted and customised as desired. Thanks to its high technological knowhow and the possibility of tailor-made solutions, Lameplast group can satisfy the needs of demanding customers worldwide. The Lameplast single dose is smarter than ever. Not only does it team practicality, safety and the right quantity of product; it also now comes with an applicator. For optimised results and to encourage correct product application, the applicator can be offered in a variety of versions. With over 40 years in the pharmaceutical packaging industry, Lameplast Group is actively looking to the future. So far, 2017 has seen the company grow ever stronger with the investment of Aksìa as the company embraces the globe with its new partners and continues to anticipate pharma packaging requirements. Barbara Reguzzoni explains what is happening. The future of packaging is looking increasingly greener and more practical. That's why Fratelli Carli's Mediterranea brand has chosen the Lameplast Group's injection-molded single-dose container in Green Polyethylene (Bio PE) for its new 'Olive' cosmetic line which features a strip of five 10ml sized white single-dose reclosable containers, printed with bioplastics of vegetable origin. Lameplast Group's Barbara Reguzzoni speaks to Webpackaging about its 40 years of expertise in the pharmaceutical industry and how the company has developed from its beginnings as a manufacturer to the complete service provider which it is today. The Russian market is now open for Lameplast Group as the company has recently received the GOST-R Certificate of Conformity for single-dose units. Un autunno ricco di novità per il Gruppo Lameplast che in occasione del CPHI Worldwide 2015, ha presentato il nuovo portafoglio prodotti arricchito di interessanti novità. The future of packaging? It's green! And so is the future of marketing. After launching the first injection molded single-dose in Green Polyethylene (Bio PE), Lameplast Group is now able to offer a full range of bioplastic containers made from raw vegetal materials as an alternative to those made from oil-based plastic. Bioplastic is a 100% renewable source unlike oil-based plastic. With more than 35 years experience and millions of single-dose units produced and filled for the biggest names in pharmaceuticals and cosmetics, Lameplast Group is the most reliable manufacturer of its kind on the single-dose packaging market. Now the Group presents an even more comprehensive service, offering customers the opportunity to carry out their own final packaging, from wherever they operate with the Pentafill range. Preservatives are a well-known drawback for ophthalmic preparations. This is why Lameplast Group has expanded the range of services offering production, filling and packaging services for preservative-free ophthalmic products also in multidose bottles thanks to its partnership with Aptar Pharma. Preservatives are used nowadays in a large number of cosmetic, pharmaceutical, and food products. The most used are the parabens which are currently under revision in Europe. As consequence of evaluations of the existing safety data, the European Scientific Committees has recommended the reduction of the actual allowed contents.